They are often confused with several species of much smaller native crickets. Although found throughout the North Island and milder coastal regions of the South Island they are usually only economically important in Northland, Auckland, Waikato, Bay of Plenty, Hawkes Bay, Taranaki and Manawatu. Black field crickets, especially the nymphs, are often confused with several species of much smaller native crickets. These only grow to about 1 cm and crickets larger than this are likely to be black field crickets. Native crickets are also active during the day and when disturbed will jump and be easily seen. In contrast black field crickets are active at night and if disturbed during the day will run for shelter and remain hidden. When threatened they will jump quickly away. Black field crickets can also be identified by a distinctive white band around their middle. Sown, or self sown seedlings, may be destroyed by cricket feeding. The potential for long term pasture damage and unseen losses makes early detection of crickets important. In areas prone to cricket damage the density can be quickly assessed by pouring a weak detergent solution (4 mls dishwashing liquid in 10 L water) over a known area of pasture. This will “flush” crickets out of cracks in the soil and make it easy to count them and determine their density. A density of 10/m2 is considered economically damaging. Populations of more than 10 crickets/m2 are economically damaging. 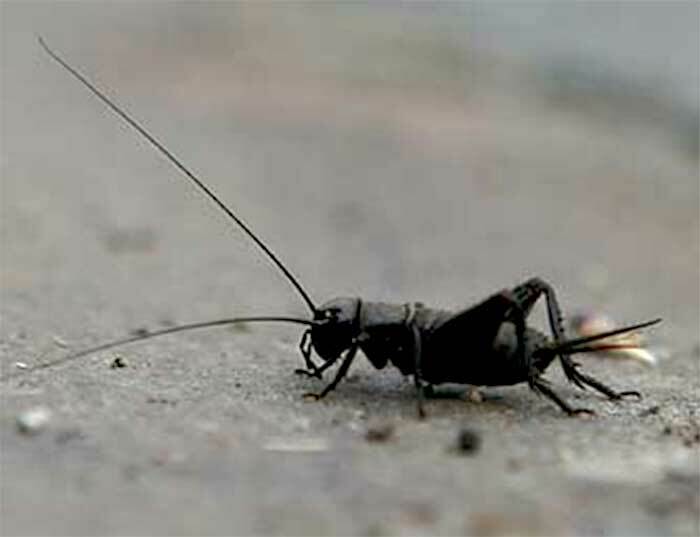 Control of black field crickets is usually by using grain baits coated with an insecticide (maldison). For more information consult the New Zealand Agrichemical Manual or an agrichemical company representative.